When working in a manufacturing or industrial environment, noise levels can vary from facility to facility from the dull sound of warehousing to high decibel, heaving machinery. And depending on which environment an employee is in, the sound level can have quite an impact, especially for a prolonged period of time. 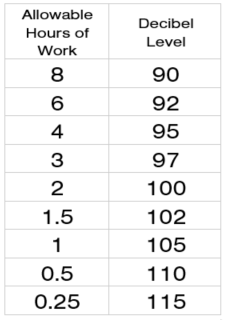 Here’s a chart that shows OSHA’s allowable hours of work for noise levels 90 and above. As you can see, once the noise level in a work environment goes above 90 decibels, the amount of continued work that is safe in this area is greatly decreased. 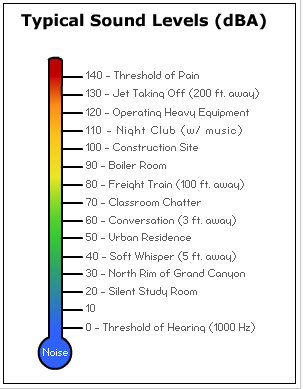 To the left is another chart that shows the typical decibel level in a variety of environments, everything from a Jet takeoff level to the decibel of a study room. If we compare the two charts a construction site, which thousands of Americans work at every day lands in the 2-hour range on our OSHA sustainability chart then, a little higher up, there’s operating heavy equipment, which a worker would only be able to do for maximum 15 minutes at a time. 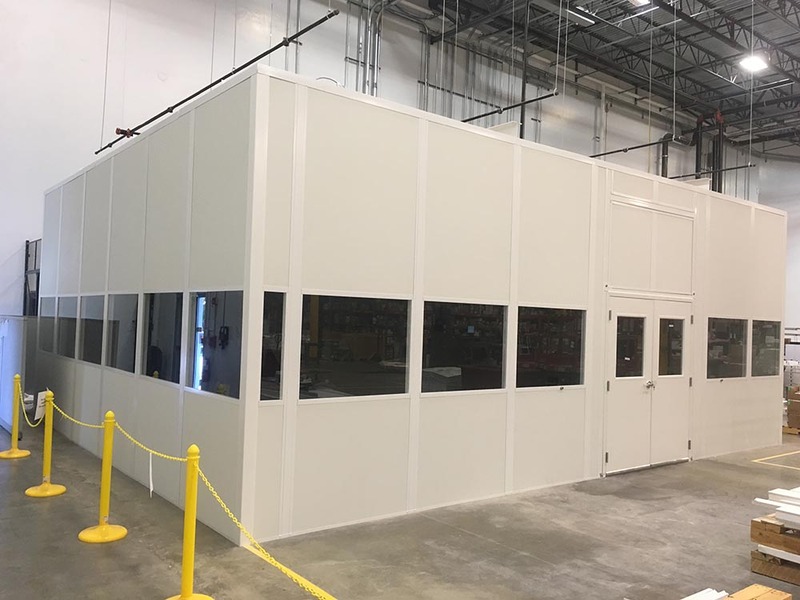 So, workers in these types of environments need some sort of relief from these high, sometimes chaotic noise levels and oftentimes a soundproof wall or enclosure is required in order to make this possible. However, soundproof walls have a number of applications rather than a break room for employees in high decibel environments. In this post, we will go through the variety of environments and applications that benefit from the use of soundproof wall panels. Continuing with our thought above, facilities or job sites with heavy machinery can consistently have decibel levels from 90-120+ which can cause permanent hearing loss if exposed to for a prolonged period of time. Therefore, any type of office area in this environment would ideally have some sound deadening properties or materials. For Panel Built, this can include, but is not limited to, adding soundboard to the wall panel, increasing the overall thickness of the panel, or a combination of both of these. In many cases, these heavy machinery offices are used for supervisors or managers of the facility. Not only will these office space need to provide enough protection to provide safety for the person’s ears, but it will need to create an environment calm enough for the supervisor to focus and plan for the future. Our next application for our soundproof wall panels is for machinery enclosures. This application is similar to our scenario above, but with one slight difference. In heavy machinery offices, the goal of the soundproof wall is to keep the sound out of the office. For a machine enclosure, the soundproof wall is going to keep the noise inside the enclosure. 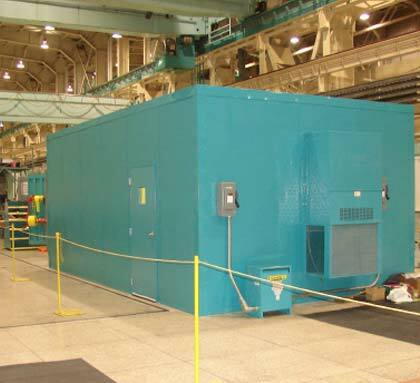 The main benefit of enclosing your machinery is to provide noise reduction for a larger area in your facility. Plus, the enclosure could protect the machinery from damage and help keep it at a stable temperature for peak performance. Another unique application for our soundproof wall panels is their use in precision measuring rooms. These rooms require an environment that is strictly controlled in nearly all aspects. They must keep at a constant temperature, have little to no particles in the air, and must have little to no vibration due to noise. The environment is so controlled because these measuring rooms use a CMM (or coordinate measuring machine) in order to exactly measure the “physical geometrical characteristics of an object.” In order to do this accurately, the object being measured can not expand or contract due to heat or vibrate due to noise. So, in this instance, soundproof panels are just one of the many requirements that must be met for this application. This application most aligns with OSHA’s guidelines on decibels levels in a work environment. A breakroom in a manufacturing, warehouse, or construction environment is typically the only way that a company will be able to fully satisfy these regulations. However, having a comfortable break area away from the often-chaotic manufacturing floor can provide added benefits outside of just satisfying OSHA codes. As we talked about in a blog post from 2016, “The Importance of Breakrooms in Your Warehouse,” a stressful and chaotic work environment can cause what is known as “brain fog” or brain fatigue in employees, creating a dulling in mental awareness. Whenever an employee is affected by brain fatigue, the chances of workplace errors and injuries increase tenfold. For this reason, providing employees with a calm, comfortable break area not only allows them to take a break and relax but could potentially reduce the number of workplace accidents that occur. This application uses our soundproof wall panels in a completely different setting and for an almost entirely different purpose. A SCIF room (or Sensitive Compartmented Information Facility room) is a US Department of defense term for a fully secure room. The purpose of this room to completely suppress and eliminate the possibility of data leakage from the inside of the room. This is accomplished in a few different ways from the construction and layout of the room to the protocols of the people inside of the room. 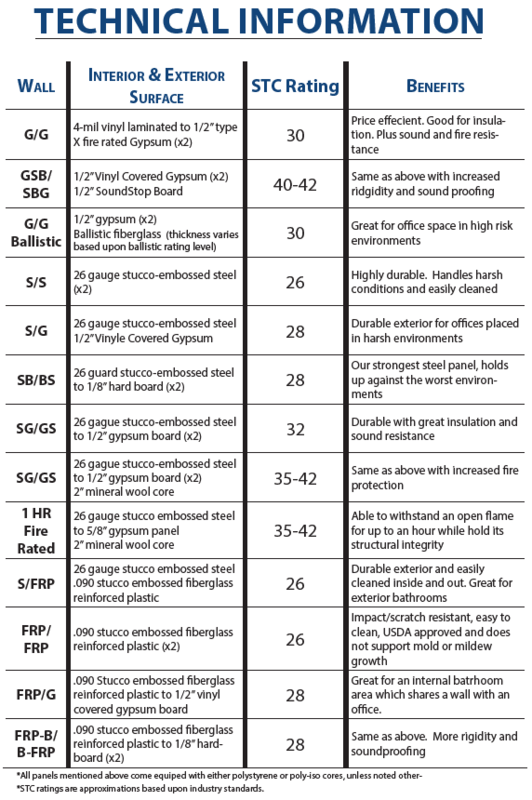 For sound suppression, the SCIF rooms must meet ICD/ICS 705 Technical Specifications for STC 45 and STC 50 requirements. Ultimately, these rooms have to be secure enough to keep people, data, and sound from involuntarily entering or leaving the room. Each of our wall panels will have a varying amount of sound reduction depending on which of the panels you are looking at and how much sound reduction is needed for the project. The STC rating of the structure or room is going to have the greatest impact on the reduction of sound inside/outside. STC stands for Sound Transmission Class. The higher the STC rating of the room, the more sound reduction the room will have. To the right is a listing of the STC ratings for our panel types. Get a free modular office quote today!